Peering into the farthest depths of the universe, the Hubble space telescope has redefined our understanding of the cosmos. It has enthralled millions and inspired a generation with its stunning images, such as the now-famous ‘Pillars of creation’ (M16 Eagle nebula) and ‘Hubble deep field’. This year marks the 25th anniversary of its launch, sparking celebrations in the scientific and amateur astronomy communities. It is a remarkable turnaround from the unsupportive atmosphere that surrounded its catastrophic beginning. 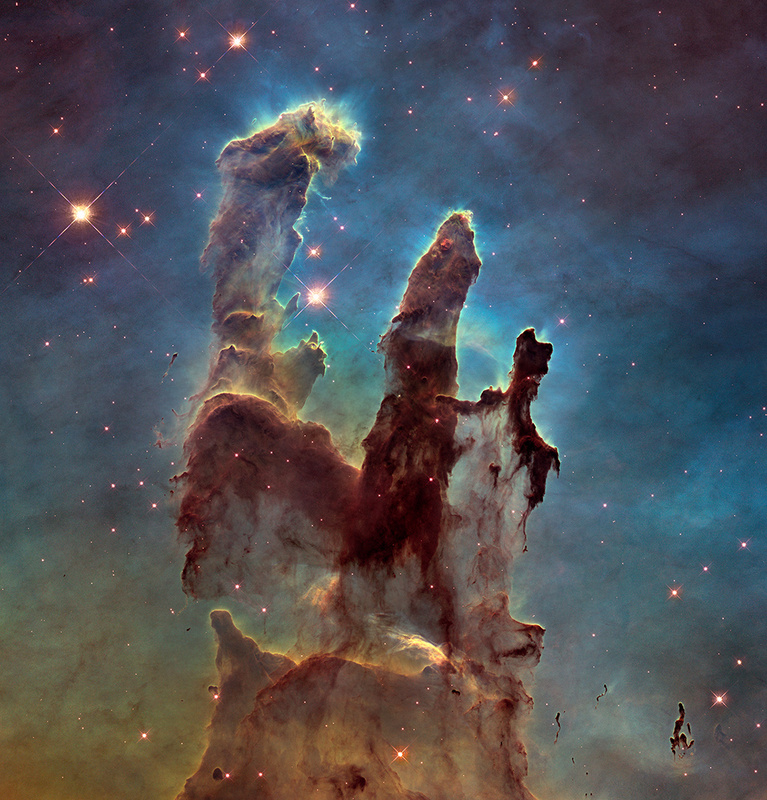 A high-resolution version of Pillars of Creation, taken in 2014 as a tribute to the original photograph. – Credits: NASA. The Hubble project, a huge undertaking that lasted more than a decade in development, was the embodiment of efforts dating back to the 1940s. Astronomers were excited at the prospect of studying the universe with the biggest space telescope available. But soon after launch, it became apparent that something was terribly wrong with the telescope. The first image taken by Hubble was not the clear, sharp picture that everyone expected. The technical team scrambled to find a cause, and soon discovered they had made a mistake. The primary mirror in Hubble, its most important component, on which so much time had been spent to render it immaculate, was actually flawed. A misalignment of 1.3mm during manufacturing had created an optical aberration in the mirror, throwing it off from its perfect shape by a few microns. This minuscule misalignment caused the light to focus on different parts of the optical axis and thus produce fuzzy images. Since there was no way to replace the 2.4-meter mirror in orbit, the telescope would operate far below its optimum resolution. The resulting media furor and political outcry threatened to sully NASA’s name and derail other big budget space projects. Coming right on the heels of the Challenger disaster, it was another huge setback for NASA. As the then director of NASA’s Astrophysics program, Charles Pellerin, said in a 2012 interview, the political brass was angry and unwilling to fund any servicing missions for Hubble. It seemed that the future of this science program was in jeopardy. 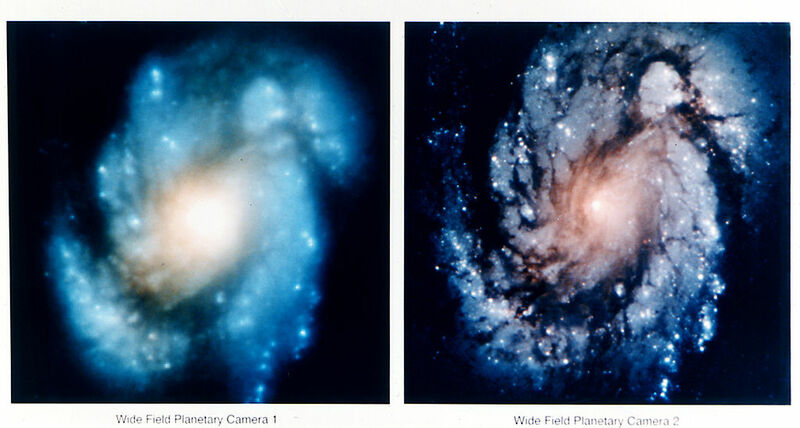 A comparison of images of the core of the galaxy M100, showing the dramatic improvement in Hubble Space Telescope’s view after the first Hubble Servicing Mission in December 1993. – Credits: NASA. Thankfully for NASA and the scientific world, Hubble had been designed to be serviced in orbit. On a servicing mission, astronauts could swap instruments with new ones with similar size and interfaces. If NASA could develop and install a corrective optics system to compensate for the mirror’s aberrations, it would restore the telescope to its intended glory. Once the politicians were convinced, NASA developed a plan to save Hubble. The Hubble Telescope, ready for deploy, with its new solar array. – Credits: NASA. In 1993, after a year and a half of grueling training, seven astronauts took off on space shuttle Endeavour. The Shuttle was launched into an orbit 360 miles above the Earth where Hubble is located. As the shuttle closed in on the telescope, controllers on the ground shut down its instruments and prepared it to be captured. The robotic arm of the shuttle then grabbed on to Hubble’s grapple point and gently lowered into a berth on the shuttle payload bay. The easy part of the mission was over. The astronauts undertook a record five spacewalks and replaced the photometer with the new corrective optics system, installed the new Wide Field and Planetary Camera 2, a new computer co-processor, the Solar Array Drive Electronics unit and the Goddard High Resolution Spectrograph Redundancy Kit. On top of that, the crew performed routine maintenance tasks such as replacing electronic control units and fuse plugs. One of the most complex human spaceflight missions ever came to a successful end almost 11 days after launch. Hubble was back on its feet, living up to its promise and relaying high quality data to the ground. Over the next 16 years, four more successful servicing missions were launched. 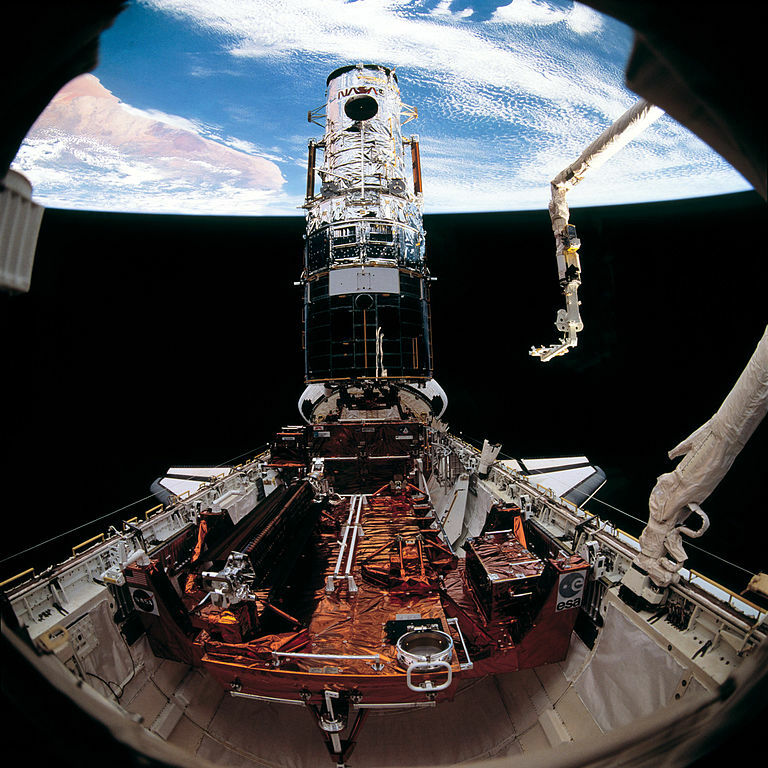 Each mission not only performed essential maintenance but also updated its science instruments, thus keeping Hubble relevant in the 21st century. 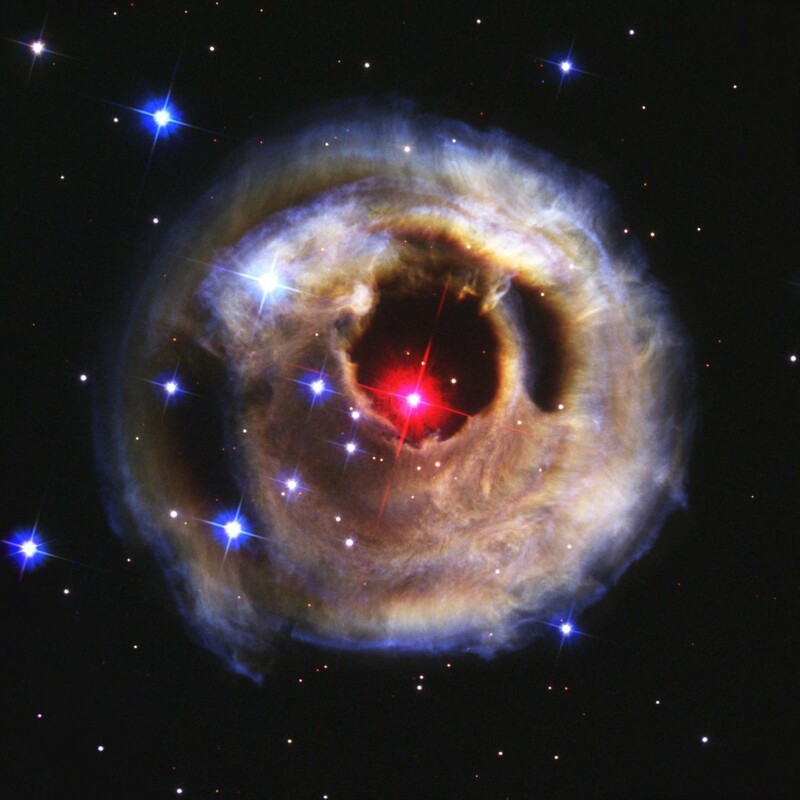 Star V838 Monocerotis (V838 Mon)- September 2, 2002. – Credits: NASA. Hubble has expanded our understanding and view of the cosmos. It has enabled us to look at some of the farthest galaxies in the universe, peer into stellar nurseries, and allowed astronomers to pin down the age of the universe. It has also given us the first glimpse of a planet around another star. It continues to deliver excellent science far beyond its planned lifetime. But with no more servicing missions, Hubble will no longer be able to compensate for atmospheric drag and maintain its orbit. It will eventually lose altitude and fall back to the Earth’s surface. The Soft Capture Mechanism that was installed during the last servicing mission will help a robotic spacecraft to safely de-orbit the telescope. – In the video below, a short documentary about Hubble. The enormous success of Hubble, both as a scientific instrument and a crowd-puller, has fostered the pursuit of observations from space. The future holds the promise of much more advanced space telescopes such as NASA’s James Webb Space Telescope and ESA’s PLATO (PLAnetary Transits and Oscillations of stars). But the story of Hubble will always hold a special place in everyone’s heart. If you liked this article, join our growing community by signing in for our newsletter by filling in the form below, or follow us on Facebook, and Twitter. To view images processed from Hubble data, go to http://hubblesite.org/gallery/album/entire. For science data (with online tools), go to http://hla.stsci.edu/ (Hubble legacy archive).